With passage of the Indian Child Welfare Act of 1978 (ICWA), Congress formally recognized Native nations’ inherent authority to govern child welfare matters and provided support for tribal self-determination over child welfare. Because ICWA “assumes that a tribal code is the governance mechanism by which a tribe establishes and implements its jurisdiction over all aspects of child well-being,” ICWA’s passage also marked the starting point for (re-)establishing tribal laws to govern the protection and care of Indian children and families. Almost 40 years later, how have tribes responded to this opportunity? How have tribes’ child welfare laws and codes evolved? How might tribes strengthen their laws to implement their jurisdiction? How are Native nations enacting their sovereignty to protect their children? 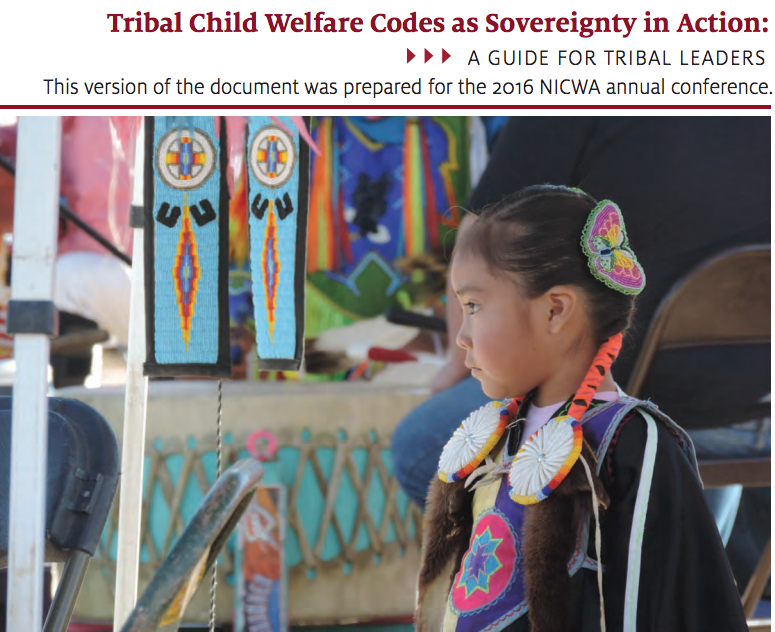 Where relevant, our discussions consider how tribal child welfare codes reflect tribal culture and tradition and how codes can reflect the specific needs of a tribal community. Throughout, the report aims to provide decision-relevant information for tribal leaders working to increase protections for their communities’ children and families. Cross, Terry L. and Robert J. Miller. 2009. “The Indian Child Welfare Act of 1978 and Its Impact on Tribal Sovereignty and Governance.” In Facing the Future: The Indian Child Welfare Act at 30, edited by Matthew L.M. Fletcher, Wenona T. Singel, and Kathryn E. Fort, 235-244. East Lansing: Michigan State University Press. A tribe’s child welfare code is its collection of laws that address child welfare. Codes reviewed were either publicly available online or accessible via the Native American Rights Fund National Indian Law Library. While this study used the most up-to-date codes found in those searches, some tribal codes may have been updated since the searches were carried out. The collection is diverse: it includes both older and more recently developed codes and codes from tribes that vary in geography and population size. The overarching study examined more than 50 possible child welfare provisions, resulting in a dataset containing more than 100 variables. Starks, Rachel Rose, Adrian T. Smith, Mary Beth JÃ¤ger, Miriam Jorgensen, and Stephen Cornell. 2016. "Tribal Child Welfare Codes as Sovereignty in Action. [Conference Edition]." Paper presented at the 2016 National Indian Child Welfare Association Annual Meeting, St. Paul, MN, April 4-6, 2016. Portland, OR: National Indian Child Welfare Association; Tucson, AZ: Native Nations Institute.